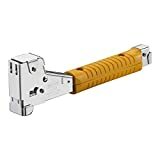 Included below are reviews of six best hammer tacker stapler recommendations that are listed from cheapest to the most expensive. Each review contains comparative design categories, as well as bullet lists of the good and not so good points regarding each hand-tool. 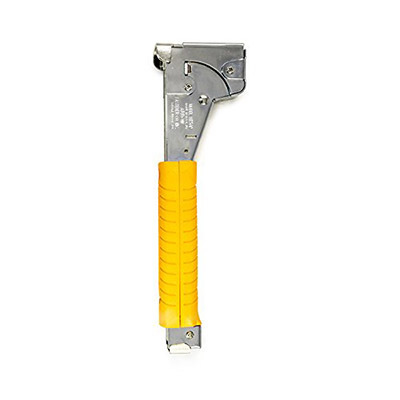 A good hammer tacker can make large jobs based on securing insulation and similar materials easier and faster. Providing plenty of staple storage and power for each drive is a necessity in these situations. 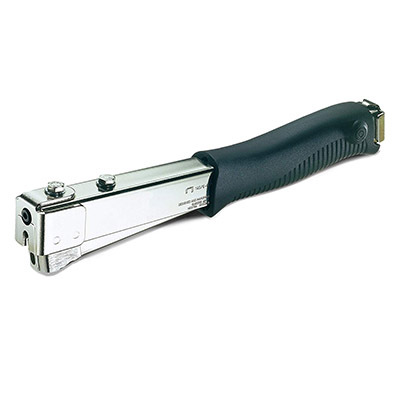 This hammer tacker stapler represents a simple design that is easy to use. Some users mentioned that they had at times a hard time with the loading process. Nonetheless, such a hand-held tool provides ample weight to sink fasteners without feeling overweight. Owners can load this product with Arrow or SharShooter brand staples. The HT50P model is designed with a large head. This enhancement is enough to allow it to drive staples effectively without adding a lot of weight. 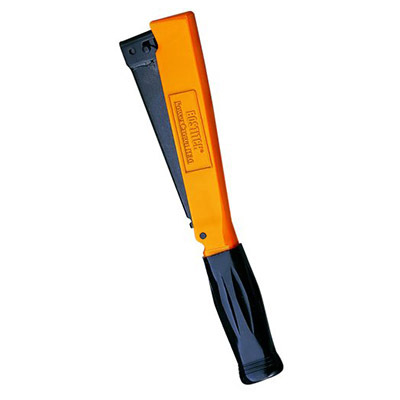 Though it can be difficult to load at first, this tool is extremely easy to use. Manufacturer recommends this product for various jobs that involve a roof, carpeting, insulation or crates. The steel body of this product is lightweight and causes less user fatigue. 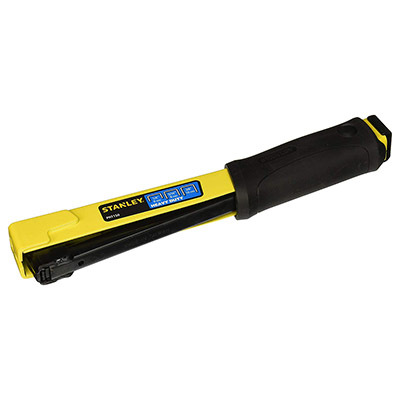 A quick-load magazine makes loading staples easy and fast. It comes with a quick draw holster and 1,000 staples, making it ready out of the box. The steel body of the R11 makes it a durable choice. It loads easily and is able to sink staples deeply. 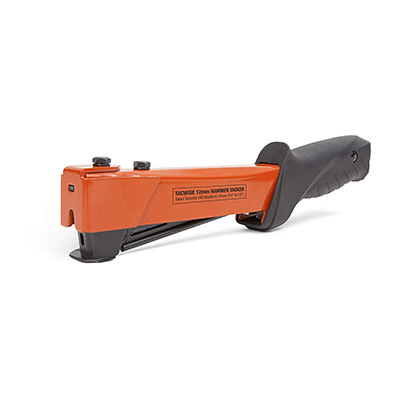 A ribbed rubber grip gives plenty of hold for this hammer tacker stapler. This Sweden-made tool is ready to serve craftsmen in their roofing, carpeting, and insulation projects. The HT550 is a heavier model that can provide plenty of energy with each drive. It uses Series 5000 staples and can hold 168 with each fill. This product loads quickly from the back-end and is easy to operate. Keep in mind that this is a heavy-duty tool. This means that it was built to keep up with daily work. Therefore, it’s not a smart investment for the occasional handyman. 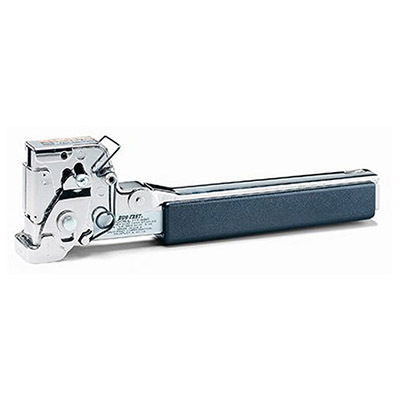 This Tacwise stapler offers comfort and efficiency thanks to its angled handle and grip. Its magazine is easy to load and holds 150 staples. The weight is evenly distributed and provides extra power. Manufacturer vouches for this product for jobs that require working with flooring, breather membrane, and plastic sheets. Each of the hammer tacker stapler reviews highlights designs that provide driving force and durability. Comfort and stable loads vary with each tool. We would love to hear about reader experiences with these tools or similar products that we did not review above!